119 To make a Leaden Plaister Take two pound and four ounces of oil of Olive of ye best of good red lead one pound, white lead one pound well beaten into dust. 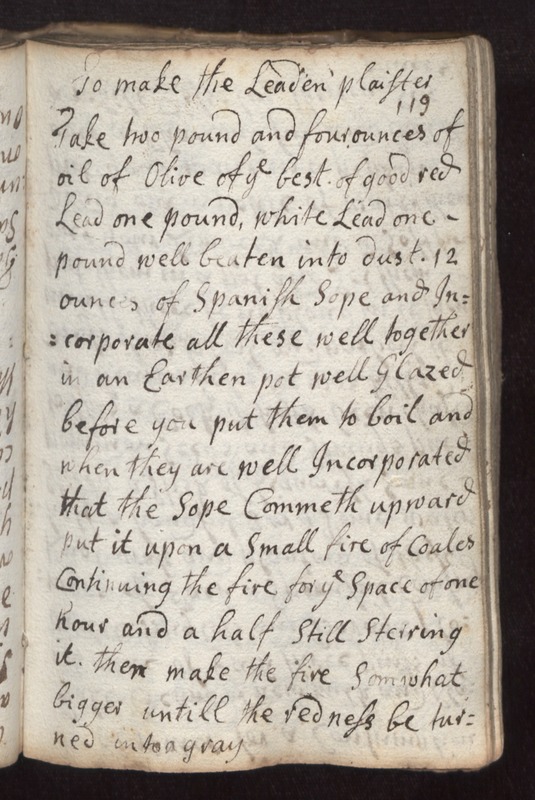 12 ounces of Spanish sope and incorporate all these wll together in an Earthen pot well Glazed before you put them to boil and when they are well incorporated that the Sope commeth upward put it upon a small fire of coales continuing the fire for ye space of one hour and a half still steiring it. Then make the fire somewhat bigger untill the redness be turned into a gray.